The parallels that artistic endeavors have with prayer and magic are really quite remarkable. And yet, few people would argue that there is an inherent "irony" that makes the creativity of artistic work either impossible or ultimately meaningless. Why not? Well for one thing, art is everywhere. Now I don't mean "everywhere" as in "everything or anything is art." What I mean is, we are surrounded by countless examples of art, every day, in countless aspects of our culture. Even when artistic or creative practice may seem strange, irrational or just plain silly (which indeed it is often believed to be, if stereotypes of the hippie-dippy or neurotic starving artist are any indication), the fruits of such labors are everywhere for us to see and evaluate for ourselves. Most of us, spiritual or not, have had moving experiences of art and can understand, at least to some degree, the persistent life of a truly great work that remains relevant and striking and meaningful, that transcends its original cultural context. In light of myriad examples and our own personal encounters with honest-to-goodness works of art, as well as seasoned artists and instructors willing and able to offer guidance and advice, it is easier for young aspiring artists to "fake it 'til they make it" (mimicking good habits of artistic practice, cultivating a self-image as a "creative type," and producing a lot of awful poetry or lopsided pottery before learning how to find their own voice and perfect their technique) without the problem of irony arising. Unlike artists, however, today's practitioners of magic especially, and those who engage in serious prayer to a lesser degree, have the burden of striking out into the nonrational world of personal spiritual practice pretty much on their own, with very few experienced role models and even fewer widely-accepted examples of effective magical work to guide them. While it's no surprise when the work of a beginning artist sometimes flops or flounders, those first exploring magic and prayer are often quickly discouraged (by their own inner critics, if not more forcefully by the skepticism of others). A sense of situational or even cosmic irony can set in, as our circumstances or the Universe itself seem to brashly contradict our plans and perceptions. But in some ways, this feeling is not so much irony (despite Alanis Morissette positing otherwise), as it is frustration and doubt, and can be overcome with encouragement, self-discipline, persistence and patience. On the other hand, I think deo would agree that when he speaks of irony, it is not the frustration of failed prayer or magic that he means, but the suspicion that even when spells and such seem to work, they do not work for the reasons we might believe. This can happen with art as well. Imagine, for example, that one night you and a friend decide to go out to a new club where live bands perform experimental jazz. Your friend sits there enraptured, apparently grooving to what, to you, sounds mostly like poorly-coordinated noise. You might wonder, "Is this really 'art'? Is my friend really having an aesthetic experience, or is he just 'fooling himself' into believing he is because of his expectations about jazz?" In order to answer these questions and put to rest this particular type of irony, we need to look more closely at the creative process itself and how it works, in science, in aesthetics, and in spiritual practices like prayer and magic. 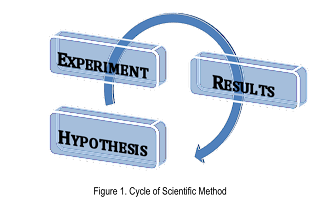 This first chart (figure 1, left) is an illustration of the scientific method as it's most commonly understood and practiced. A scientist formulates an hypothesis that she wants to test, develops an experiment to test it, and gathers results by careful observation. From these results she works towards refining her original hypothesis, postulating about possible conclusions she can draw from her results, and the cycle begins again. The exact method of gathering results may vary, of course; sometimes, instead of setting up a particular experiment, a scientist (a biologist studying the behavior of black bears, for instance) may do observations in the field, recording events and their circumstances as they arise and from these compiling statistical data. But the process is essentially the same. If we think of the vertical axis of the chart as representing the continuum from the "mind-internal" realm of logic and abstract ideas to the "mind-external" world of physical reality, we can see that the scientific method cycles through both: the experiment and results of that experiment occur in the concrete, material world, while the scientist develops and later analyses her hypotheses using the rational, abstracting capacity of her conscious mind. Of course, the subconscious does play a role in the scientific process (albeit an oft ignored or underemphasized one), in getting the scientist from an abstract theory to a practical test of that theory, and again from the raw data of results to their hypothetical implications. But generally, the process of the scientific method focuses on the rational mind gaining theoretical knowledge about the physical world, moving primarily in a single direction, as shown. This process works for science; however, a pictorial representation of the aesthetic process must be tweaked to suit (figure 2, right). One reason this is so, is the widely acknowledged fact that an "art object" (i.e. the physical painting, sculpture, text or performance) is not identical to the "work of art." Rather, a work of art must involve a person's aesthetic experience; in other words, an art object only becomes a "work of art" when it is engaged by a viewer (or listener, or what have you). In some ways, then, a work of art is always in flux, surfacing into realized existence when witnessed and then sinking back into a state of potential. (I realize this is a difficult concept to grasp, so some further examples might help. A musical score, for instance, is an art object, but it does not become a work of art until it is played, even if the musician himself is the only one around to hear it. Likewise, in my living room I have a whole shelfful of poetry books; the poems in these pages exist in a state of potential, as textual "art objects" lurking between the covers, but were I to open one of these books, flip to a page and read one of these poems, either silently or aloud, I would experience the poem as a "work of art." It helps to think of "art objects" as dense things that need to be "activated" like some science-fiction device, while the "works of art" are just that, works, activities, experiences that are going on.) Yet a work of art is not identical to or synonymous with a person's experience. The same work of art--the same song, story or drama--can be experienced in many different ways by different people, or even by the same person at different times and under different circumstances. Thus we have an aesthetic process that is not a unidirectional cycle from abstract to concrete, internal to external, as we did with the scientific method. Instead, at each point in the aesthetic process, we have an intimate exchange. As an artist works to make a piece of art, he endeavors to move his own abstract ideas into the realm of the concrete, but as we explored in the last post, the concrete world of particulars has an equally strong influence on shaping the artist and his intentions. Meanwhile, a given art object will elicit experiences in those who witness it, but as we've already discussed, the experiences (past and present) of these witnesses will themselves influence the art object in transforming it into or engaging it as a work of art. 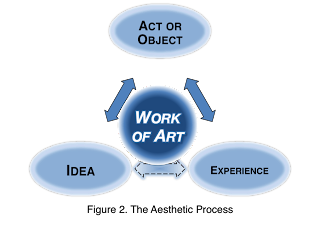 In the creative process, the artist plays the part both of creator and witness as he shuffles and sidesteps towards a final product, sometimes allowing the medium of the work to guide him, and sometimes stepping back and evaluating his own experiences of the object to see whether or not he is expressing or communicating his intentions effectively. (Here we see how both interpretations of the relationship between artist and medium play a role in the process.) What we find is a fascinating, weaving triad of give-and-take (my Druidic self revels in this triple aspect! ), and within all this, the "work of art" remains in a kind of misty state in the center, changing and responding, drifting in and out of realization. Coming soon... "Spiritual Aesthetics: Part IV: Irony in Creative Practice"
Continuing to be one of my favourite blog series. I notice an interesting parallel between your two charts of scientific and artistic praxis to the concept of OODA (orient-observe-decide-act) Loops, made by military strategist John Boyd. These are some thought-provoking posts. Thanks for taking the time to articulate this so clearly (and with diagrams, no less). The discussion of engagement, of intentioned surrender, relating it to magic, just great! I do wonder about how well the two models here really differentiate the scientific from the aesthetic, though. They don't seem to be treating comparable moments of the two processes. Your model of a scientific process emphasizes a single experiment, whereas your model of the aesthetic process emphasizes the work and its reception. Reception and audience are essential to understanding scientific work, too. Even before the results become 'public,' there is a good deal of work that goes into how to frame and deliver them in an article. An experiment's results, once reported, need to be 'activated' in much the same way a poem needs to be activated. Activation may even be more important to scientific work, since unactivated data cannot be used to fuel further experiments. In a similar vein, there is a great deal of intimacy in that process of making sense of an experiment, considering its implications, that seems quite close to what happens in the reception of a work of art. Ian, Thanks. :) I'm glad you enjoyed the series. As far as your points about comparing science and aesthetics, for the most part I think I agree with you (I do mention the role of the subconscious--that intimacy in making sense of an experiment--in this post and touch on it in passing in the comments to Part IV). The main thrust of these posts, however, was not to make an exhaustive study of scientific versus aesthetic metaphors for magic; it was to address a very particular objection to magic as being inherently "ironic" in nature. I don't think that objection stems from a larger understanding of the scientific community and the way in which experimental data is communicated, processed and utilized among scientists. Rather, I think it stems from a direct comparison of magical working to the scientific method itself (and that method is not limited to a single experiment, but is a cyclical process involving refinement and repetition). Magic, when it is compared to science, is not usually viewed as a system of communication, but an exercise of discovery in which the effects of exerted power (in the case of magic, willpower) are observed and analyzed. I emphasized the experiential, social aspect of aesthetics because art is, much more commonly than science, viewed as partly (if not mostly) about communication, and the act of discovery or exercise of power is often only a means to this end. You point out, and quite rightly, that the way in which knowledge is accumulated and passed on within the scientific community has obvious parallels to the process of aesthetic communication. But I think these similarities have less to do with scientific versus aesthetic models, and more to do with the nature of social communication in general. I have several friends who work in the sciences, and they range in their attitudes from "lab rats" (who'd rather move on to the next experiment than bother with the annoying job of having to write about their last one) to the theorists (who would rather contemplate the Big Picture all day and only resort to experiment when their ideas demand expression in testable terms that the rest of the scientific community will accept as credible). In other words, some scientists are more interested in the concrete experimental work, while others are more interested in the communication of ideas to which those experiments have led. But regardless of each scientist's personal attitude, the results of an experiment remain concrete, quantifiable and (usually) repeatable, whether or not the larger contemporary scientific community is receptive to them. The history of science is full of experiments "ahead of their time," producing results that were explained with inaccurate theories--but while the theories have been disproved, the experiments themselves can be repeated with the exact same results (and this time, more reliable theories to explain them). In the case of aesthetics, this just isn't true. A work of art never has a reliable, continued existence outside the aesthetic process. While experimental data is experimental data, a urinal may be a practical bathroom fixture one day and an art object the next (and then it may go back to being a practical mundane fixture). What determines the definition of something as an "art object" is precisely its relationship to the process and whether or not it is viewed as creating--through both rational and experiential engagement--a "work of art." On the other hand, as I've said, data results may be useless if not interpreted correctly or communicated effectively, but they still remain results; their "metaphysical" essence is not in jeopardy. Rather than dithering over examples, I should probably confess my biases ;-). But I think these similarities have less to do with scientific versus aesthetic models, and more to do with the nature of social communication in general. Yes, I 100% agree with you. Here's my conviction (my bias, if you will), though: those underlying social structures which magic, aesthetics, and science share in common are also the same structures that make them all 'effective' in any sense of the term. Or, in other words, they all derive their vitality from a common wellspring that we have (falsely) divided up between the different ways of pursuing them. What if there aren't substantively different models only different pursuits? Now, of course, you don't have to accept that I'm right about that. If you don't, that's cool, and I still get so much from your posts. What excites me in reading these posts is that I see you rejoining those elements around the topic of magic. You've given me all these wonderful examples for thinking about the process of reunification. Similarly, what concerns me is seeing you reaffirm what seem like false boundaries generally even as you demonstrate their failure particularly around the topic of magic. That, too, is a wonderful occasion to contemplate my conviction, in the pattern of resistance. "What if there aren't substantively different models only different pursuits?" If I'm understanding you right.... I agree, I think that this is precisely the case. Perhaps it doesn't come out in my writing because I take it as such a fundamentally obvious principle. To me, saying that an underlying model of social communication is what makes communication in society (and, by extension, the cohesion and growth of that society) "effective" borders on a tautology. But I do still think that discussing different models and methods of how we engage with the world is profoundly important. I like the analogy of the huge circular room with dozens of windows that all look out onto a courtyard in the very center. From each window, the view will be slightly different, even though every view looks out into the same "space," the same world. Some windows may be tinted, so that the scene seems infused with warm colors or cool colors, other windows might be marked with grids and guidelines so that it's easy to get a quantitative feel for the structure and spacial relations of the courtyard. Science, aesthetics, religion, politics, magic, interpersonal relationships--these are different "windows" that help us to see the world in slightly different ways, but the world itself remains the same and transcends beyond any single view we have of it. Thus, communication of these views to each other (and the ability to switch views ourselves in order to gain a more personal perspective) is vital. When I talk about these different models, I am not really talking about the nature of reality or the world, and that some things are "magic" and some things are "art" and some things are "science." Rather, these are models for how we engage with the world in different ways, they are methods of pursuit, as you point out. This is why I don't try to reject the idea that there is irony in magic. Certainly, when we look at some world-happenings through a "scientific" window, they seem rather messy and unimpressive, and this gives rise to irony when we try to justify that messiness and conform it to a perspective that doesn't offer the "best view" of the situation (like trying to see what's behind a tree by staring harder, instead of just moving to another window). But change the view--move slightly towards the kind of view we have or the method of approach we take when we're "doing art"--and things become clearer, they make more sense. Does this change the nature of the events and objects themselves? Not really. What changes is our understanding of them, our method or model for engaging them. My argument is that a diversity of pursuits is not only helpful but necessary precisely because the world is such a wild, complicated thing that no single model can tell us everything. In the pursuit of science, we engage the world in a very particular way, and it is distinct from the way we engage the world through art or magic, which is why it is so useful. It offers a perspective that we could never have had without it. Putting scientific concepts and the data collected into practical use then becomes the next step in the process, the next method of engagement, so we switch things up a bit, seek an effective method of communication and collaboration. These are not separate and distinct steps most of the time, but on-going methods that overlap. We are pursuing a scientific model of investigation at the same time that we are pursuing an effective social model of communication and application. These models are in reference to the same world, and pursued by the same people--indeed, they must be--but that does not mean that we can simply replace one with the other or declare that one particular method of pursuit is the most effective or the only truly effective one. Likewise, there are plenty of differences between aesthetics and magic, despite their similarities (maybe eventually I'll write a series exploring how magic is not like art, even though art can offer an illuminating analogy). They overlap and inform one another--in the same way that science can overlap and inform both art and magic (take, for instance, a mathematical analysis of scales and chord progressions in music)--and so in some ways they do converge. But they are also distinct for a reason, because their distinctness offers us a diversity of approaches. If magic were exactly like art, then I would have been content to be an artist and would never have felt a need to pursue magic as well. The "wellspring of vitality" that you talk about, from which science, aesthetics and magic all derive their efficacy, is nothing other than the world itself. Of course an honest, intense engagement with an infinitely subtle and complex world will lead to thriving pursuits of all kinds, regardless of the model. This does not have to lead us to a "false" division unless we assume that there should be only one way of engaging with the world. We can recognize some basic underlying similarities between the different ways we pursue such engagement without attempting to blend all methods and models together and obscure their differences. 'Disagree' seems like such a strong, clumsy word to use, since the differences between our two relative positions isn't profound. Still, there are differences which I want to articulate. This is getting substantial enough, though, that I'll take it back to my blog where I can more gracefully format my side of the discussion. I think a lot of our differences really are a matter of casuistry (in the good, not pejorative, sense) and it is really interesting to try and pin down how those work. I'll do that when I get a little time to myself. Alrighty then, let the clarification begin. Here is a link. This just begins to scratch the surface of things, but it's a start.